Widespread population ageing (Keates and Clarkson, 2004) has increased the importance of considering older and disabled people in the design process and reducing their exclusion from product usage. Accordingly, approaches such as ‘inclusive design’, ‘universal design’ and ‘design for all’ have been developed to help designers to include different user groups in design. Inclusive design research understands users’ abilities, needs and expectations, strives to relate the whole range of users’ capabilities to the properties of product interfaces, and aims to optimise design for maximum accessibility and minimise the effort required in using products. Currently, companies start to adopt a more inclusive approach to design led by a twofold moral and financial incentive. Previous research has shown that designers can provide good interaction in products by paying more attention to mental models of users, prior tacit knowledge, interface metaphors, affordances and mappings (Krippendorff, 1989; Norman, 2002). 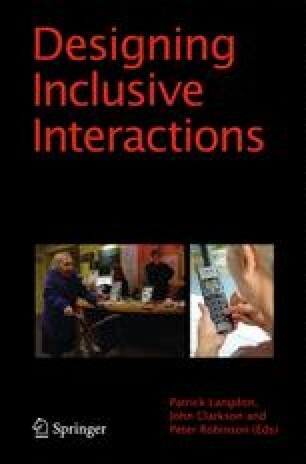 It is believed that inclusive interaction in products can be achieved by means of minimising the sensory, cognitive and motor effort required for product usage, facilitating simplicity and intuitiveness, providing perceptible information and enhancing user satisfaction (Langdon et al., 2010). To support designers in designing more inclusively, tools that foster understanding of sensory, motor and cognitive difficulty with product interactions are required. While the most valid technique will always be to have users interact with the product in question, a variety of constraints mean that this will not always be possible.